They are fast growing, you can establish a good screen in a few years. Foliage is naturally dense, which means you can block out neighbours and reduce noise. Once established they are reasonably drought tolerant. So little to no watering after 2 years. They are very easy to prune. You do it yourself with no worries about damaging the plant. They will grow back. Spacing – This will depend on variety, however 1 metre is a good indicator for most hedges. Pruning – One of the great things is that you can prune Lilly Pilly hedges as hard as you want to. Generally it is best to prune once a year, in late winter spring just before new growth commences. However you can prune them right back to the ground and they will reshoot. Leaf Size – Some varieties have smaller leaves than others and look better after pruning. Psyllids – Acmena smithii varieties are Psyllid resistant. Fruits – Most are edible, some are sweeter than others with S. luehmannii being regarded as the sweetest, so a fruiting hedge. Growing in containers – Acmena smithii is regarded as the best variety for containers. Varieties of Lilly Pilly Plants for sale for use as Trees Hedges include Lilly Pilly species and cultivars from Syzygium, Waterhousea and Acmena species. All are used widely as hedging plants, with the smaller leafed varieties being amongst the best as this makes pruning easier. It is possible to buy plants from online nurseries as tube stock or advanced plants. The size you choose will depend on how quickly you wish to create a screen. This will depend on variety and if you are after an informal screen, or a more formal hedge. For a screening plant, try spacings of 2 metres to 2.5 metres apart. You can go to 3 metres if needed. You can use electric or petrol hedge trimmer. or you can use garden shears. It is best to prune with a slight narrowing toward the top of the hedge. The top also needs to be pruned evenly and a string line will assist with this. It is always advisable to remember to prune the back of the hedge as well, especially if it is against a neighbours fence. This reduces the risk of neighbours needing to prune overhanging foliage, and perhaps indadvertedly damaging the hedge structure. Use a native plant fertiliser, not a general purpose fertiliser for you lilly pilly hedge. Aways water well before fertilising and after fertilising. Spring is the best time to apply. The lilly pilly has become one of the most popular hedging plants in Australia and many new cultivars or varieties have been released in recent years. They are the most popular native Australian plant. A hardy evergreen that is great for hedges or as a screening plant . 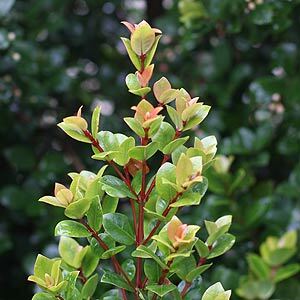 From tall growing types ( over 5 metres) to smaller varieties (under 1 metre) their will be a Lilly Pilly that is right for you, including: Syzygium australe ‘Bush Christmas’, S. australe ‘Aussie Southern’, Syzygium luehmannii ‘Royal Flame’, Acmena hemilampra , smithii. The purple berries on Lily Pilly trees are an added attraction the berries on Syzygium paniculatum is reputed to be sweet and edible and are sometimes used for making jam. The berries certainly attract birds. Widely used in landscaping as a hedging plant new disease resistant varieties are the best option for the home garden. Cultivars come in a range of varieties that will grow to different sizes, dwarf growing cultivars are increasingly popular.